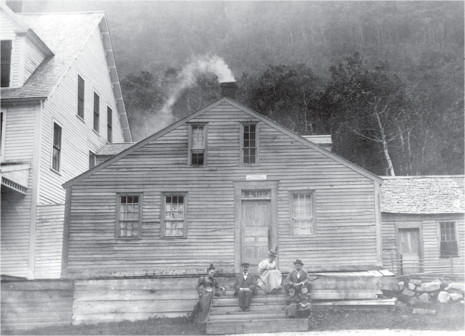 During the fall of 1825, Samuel Willey, Jr. of Bartlett moved into a small house in the heart of Crawford Notch with his wife, five children, and two hired men. The first year, the three men enlarged and improved the house, which the family operated as an inn to accommodate travelers through the mountains on the desolate notch road. The little cluster of buildings was situated in the shadow of what is now called Mount Willey. In June, following a heavy rain, the Willeys were terrified when they witnessed a great mass of soil and vegetation, torn loose from the mountainside across the river, slide in a path of destruction to the valley floor. 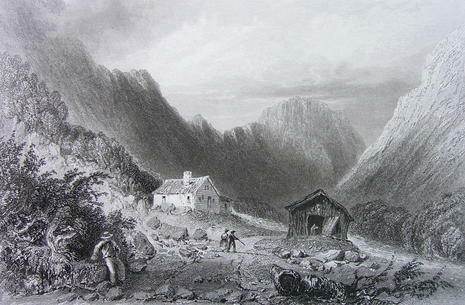 As a result, Mr. Willey built a cave-like shelter a short distance above the house to which the family could flee if a slide threatened their side of the valley. During the night of August 28, 1826, after a long drought which had dried the mountain soil to an unusual depth, came one of the most violent and destructive rain storms ever known in the White Mountains. The Saco River rose 20 feet overnight. Livestock was carried off, farms set afloat, and great gorges were cut in the mountains. Two days after the storm, anxious friends and relatives penetrated the debris-strewn valley to learn the fate of the Willey family. They found the house unharmed, but the surrounding fields were covered with debris. Huge boulders, trees, and masses of soil had been swept from Mt. Willey’s newly bared slopes. The house had escaped damage because it was apparently situated just below a ledge that divided the major slide into two streams. The split caused the slide to pass by the house on both sides leaving it untouched. Inside, beds appeared to have been left hurriedly, a Bible lay on the table, and the dog howled mournfully. Mr. and Mrs. Willey, two children, and both hired men were found nearby, crushed in the wreckage of the slide. The bodies were buried near the house and later moved to Conway. Three children were never found. The true story of the tragedy will never be known. Poets and writers have conjectured many possibilities. Perhaps the family, awakened by a threatening rumble, fled from the house to their cave, and was caught in one stream of the slide. It seems more likely the Willeys started to climb the slope of the mountain to escape the rising floods and were caught in the landslide. Whatever the circumstances of the tragedy, it has endowed this part of the White Mountains with a legend enhanced by the awesome crags which rise guardian over the site of the former Willey home. Following the tragedy, an addition was built onto the house, which was operated as an inn until it burned in 1898. The Willey family was killed by a landslide on August 28, 1826, after one of the most violent rain storms to hit the region. The Saco River rose quickly overnight, carrying away buildings, livestock and other debris. The Willey family, who had escaped their home, fled to a stone shelter on the property. The whole family and their hired hands were all killed in the landslide. But the house, which was protected by a ledge from above, was spared any destruction, leaving the house in untouched condition. On August 28, 1826, torrential rains in the White Mountains caused a mudslide on Mount Willey. The Willey couple, with their five children, lived in a small house in the notch between Mounts Willey and Webster. They evacuated their home with the help of two hired men to escape the landslide, but all seven Willeys and the two hired men died in the avalanche. The Willey home was left standing. Rescuers later found an open Bible on a table in the home, indicating that the family retreated in haste. The news of the Willey tragedy quickly spread across the nation. During the ensuing years, it would become the subject of literature, drawings, local histories, scientific journals, and paintings. 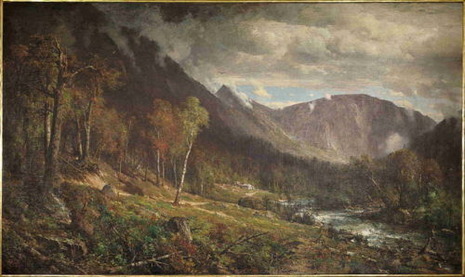 One such example is the painting by Thomas Hill (1829–1908) titled Crawford Notch, the site of the Willey tragedy before the slide. The Willey disaster started a new awareness of the American landscape and the raw wilderness of the White Mountains. This allure — tragedy and untamed nature — was a powerful draw for the early artists who painted in the White Mountains of New Hampshire. Thomas Cole (1801–1848) in his diary entry of October 6, 1828, wrote, "The site of the Willey House, with its little patch of green in the gloomy desolation, very naturally recalled to mind the horrors of the night when the whole family perished beneath an avalanche of rocks and earth." The incident provided the basis for an 1835 story by Nathaniel Hawthorne titled The Ambitious Guest.